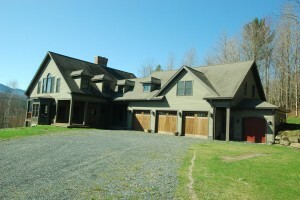 Stunning mountain views make this luxury six bedroom, four and half bathroom a one of a kind long term rental. Custom built by a master craftsman, this home has it all. Enter into the spacious foyer, which has its own washer and dryer for wet and muddy clothes and a dumbwaiter for bringing firewood from the basement. From there move into the chef's kitchen with all high-end Viking appliances, included two full ranges, restaurant style exhaust, instant hot water, two dishwashers, an oversized refrigerator and wood fired pizza oven. The open kitchen includes the dining room large enough to seat a table for 12 or more. The open flow continues into the oversized living room with expansive Worcester Mountain and Stowe Hollow views. The living room features a wood burning fireplace and wrap around deck. Just off the living room you will find the formal entrance to the house and a piano room with views on three sides.